Apple has deployed iOS 10.3. All I can say is … WOW. OK … I can and will say more. Still … WOW. Off course iOS 10.3 supplies all of the security features I mentioned earlier, but more importantly it is the first deployment of the new Apple File System (APFS). I will try to summarize below, but the following links do more justice to an explanation than I ever could. To put things in perspective the HFS+ file system currently in use on Macs and iOS 10.2.x iDevices is over 30 years old*. HFS+ is more than one and a half human generations old. Most people using iDevices aren’t that old. In the computer world 30 years is OLD. Think about it … what level of technology were you using 30 years ago? HFS+ and its predecessor HFS are more than 30 years old. These file systems were developed in an era of floppy disks and spinning hard drives, when file sizes were calculated in kilobytes or megabytes. Today, people commonly store hundreds of gigabytes and access millions of files on high-speed, low-latency flash drives. People carry their data with them, and they demand that sensitive information be secure. Apple File System is a new, modern file system for iOS, macOS, tvOS, and watchOS. It is optimized for Flash/SSD storage and features strong encryption, copy-on-write metadata, space sharing, cloning for files and directories, snapshots, fast directory sizing, atomic safe-save primitives, and improved file system fundamentals. Apple File System is a 64-bit file system supporting over 9 quintillion files on a single volume. This state-of-the-art file system features cloning for files and directories, snapshots, space sharing, fast directory sizing, atomic safe-save primitives, and improved filesystem fundamentals, as well as a unique copy-on-write design that uses I/O coalescing to deliver maximum performance while ensuring data reliability. 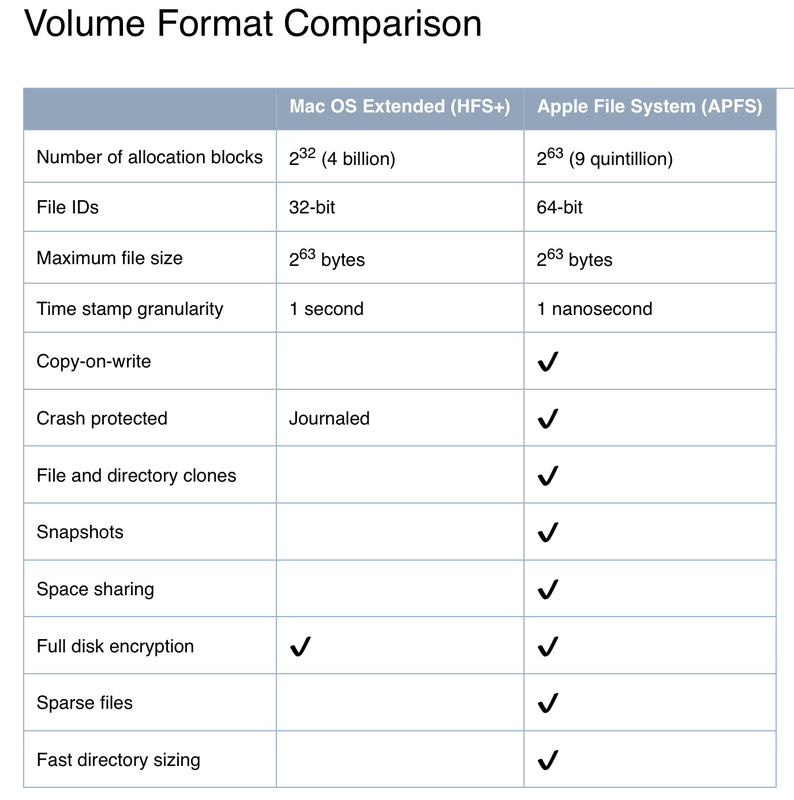 Apple File System is uniquely designed to meet the needs of Apple’s products and ecosystem. Apple File System provides strong encryption, ultra-low latencies and limited memory overhead. It is optimized for Flash/SSD storage and can be used on everything from an Apple Watch to a Mac Pro. As I said, the links provided above explain the benefits of APFS much better and in more detail than I can. I am in fact still digesting much of it. Suffice it to say that AFPS is a file system for the twenty-first century and beyond, a world of mobile devices and solid state storage. And it all starts with iOS 10.3. Download and install it now. * 30 dog years is over 130 human years. Ask Maggie.